This IBM® Redguide® publication explores the business challenges that CIOs in the banking industry face today. It focuses on three core concerns: Ways to reduce the business risk that is involved with operating IT systems and improving infrastructure resilience, enabling business growth by quickly meeting increasing demands from customers, and meeting rapidly changing regulatory compliance requirements. 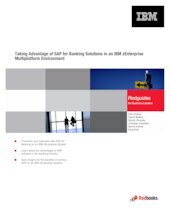 This guide explains how the technology of the IBM zEnterprise® System running SAP for Banking solution solves these major challenges in a cost-effective manner. It provides insight for banking CIOs, executives, managers, and other decision-makers, including IT architects, consultants, and systems professionals.